When you’re building a content strategy you can talk about everything from content inventories to project deliverables, but at the end of the day what it all comes down to is that you’re deciding on how to tell your story. That story can be about a corporate philosophy or how your company builds the best widgets in the world. The details of both images and content let the potential buyers that this 1955 Austin-Healey 100 BN1 Competition Special has a great story to tell. That story can also be about something as simple as a used car. In this case, a very special automobile and very elite auction service. The car is a 1955 Austin-Healey 100 BN1 Competition Special, and the sale was The Scottsdale Auction, presented by Bonhams Auctions in Phoenix, Arizona. The car was meticulously restored and customized by it’s owner and acclaimed as one of the finest examples of an Austin Healey in the country. When the owner passed and the family decided to sell the car they had several offers, but not to the value they expected. They tried to auction the car at the nationally recognized Barrett Jackson Auction, but again the car didn’t bring the right price. When they stepped back and reconsidered their options they realized they still weren’t reaching the right audience. 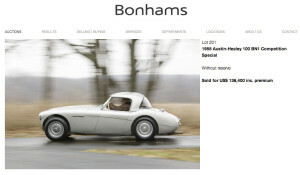 That’s when they reached out to Bonhams Auction, who not only could deliver the car to the right audience (collectable european car buyers) they knew how to tell the right story. Read the description of the car presented on their website. While the details of the restoration are in-depth, what really comes through is the story of the car. When you’re done reading you know about a 16-year-old kid who fell in love with the car 40 years ago, sold it, and then got it back so he could finally build his dream car. Described as a “Brilliant expression of what might have been,” …the description of the restoration goes into more detail, “by a renowned Healey aficionado, this 100 impresses with its extraordinarily tasteful craftsmanship and choice of period-correct performance upgrades,” and, “…the restoration and design of Baker’s 100 BN1 Competition Special is nothing short of breathtaking.” The potential buyer of the car knows that this is a car with a history, and a passion. With that story in their heads, the collectors saw the Austin-Healey roll up to the auction block. They were at the right place at the right time. The result was a price almost twice of any other offers they had received before, $136,400. In the end, the goal was met. The sellers were happy with the final sale, and the new owners have a truly unique car with a new story to tell.